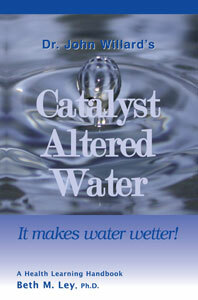 Catalyst Altered Water - It Makes Water Wetter! CBS’s 60 Minutes reported on the amazing abilities of Willard Water, from healing what ails you to growing champion blue ribbon produce! This is an important, useful book for all Willard Water users. Willard Water is a more biologically active form of water, it works better than regular water. Willard Water is not a nutrient, but a vehicle by which nutrients are carried throughout the body’s cells, and by which waste is carried away. Willard Water is simply water which has been specially altered by a catalyst. When added to regular water it makes water “wetter,” more reactive, and more efficient, yet is totally safe.